China has become the world’s most dynamic FinTech market, as total FinTech investment in the country reached 50% of the global total in 2017, ranking first worldwide.In today’s world, artificial intelligence (AI), blockchain and big data are profoundly affecting the future development of the financial industry. Looking ahead, how should we draw up the blueprint for FinTech in China? What are the major changes in the business models and operation models of banks, insurance companies, brokerages and fund companies? How can FinTech further integrate with automobile finance, consumer finance, and supply chain finance? What are the preferences of the capital market for FinTech? How do we interpret FinTech supervision and regulation? What actions should be taken to recruit and retain talents? 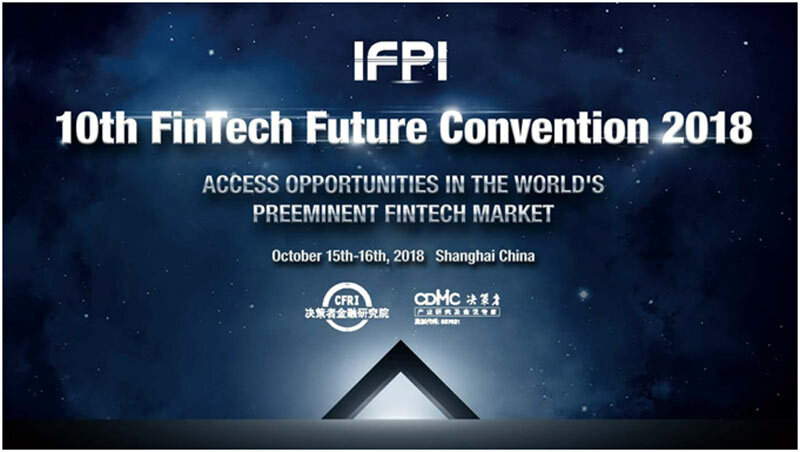 10th FinTech Future Convention 2018 (hereinafter as IFPI2018) will commence on October 15th-16thin Shanghai, China, with the theme of “Access Opportunities in the World’s Preeminent FinTech Market”, organized by CDMC Finance Research Institute (hereinafter as CFRI) and CDMC Group. The event will attract 1500+ high level participants and 100+ top speakers. IFPI2018 will address the hottest topics affecting the FinTech sector, such as FinTech regulation, the future of banking, Auto finance, InsurTech, consumer finance, supply chain finance, blockchain, big data, cloud computing, AI, etc. We look forward to seeing you at the event in Shanghai, China. IFPI2018 is committed to building a docking and exchange platform of thoughts, talents, technology, information and funds in the FinTechfields worldwide. IFPI2018 will attract 100+ top experts in the global Fintech field. IFPI2018 will address the hottest topics affecting the FinTech sector, such as FinTech regulation, the future of banking, automotive finance, InsurTech, consumer finance, supply chain finance, blockchain, big data, cloud computing, artificial intelligence, etc. IFPI2018 will set up three platforms for participants：Comprehensive Learning & Communication, The Most Inﬂuential Chinese B2B Marketing Platform, FinTech Cooperation Circle Building. “The Belt and Road” has become the most important cooperation mechanism in the world, financial cooperation plays a core role in the construction of the “The Belt and Road”. Organized by CFRI, industrial associations and FinTech enterprises, the “FinTech Global Cooperation Strategic Alliance” will be launched on October 15th. The alliance is committed to sharing experience in global cooperation, docking of government and enterprises, localization, global investment and ﬁnancing, technology introduction, and building a strategic platform for cooperation among governments, associations, banks, insurance companies, payment providers, internet lending platforms, consumer ﬁnance providers, supply chain ﬁnance, AI, blockchain, big data and other core institutions. Welcome to join in “FinTech Global Cooperation Strategic Alliance”. It was exciting and an honor to share to the audience about FinTech ecosystem. We discussed opportunities and collaboration with Mainland companies. Thank you to the organizing committee for having us and running an excellent conference. Glad to share developmental opportunities and challenges in FinTech of Singapore, Malaysia and Hong Kong with fellow partners David SK Fong (President of FinTech Association of Malaysia) and Syed Musheer Ahmed (GM of FinTech Association of Hong Kong) at the IFPI- Situational Finance Technology Congress in Beijing recently, and also gained a deeper understanding of the potential and challenges of FinTech in China. Many China finance technology companies are looking to expand in the attractive South East Asia (SEA) region and looking for forward to help them using the platform of ASEAN FinTech Network (AFN). We are glad to cooperate with China FinTech companies. IFPI2018—FinTech Future Awards are here again to celebrate the industry’s best practices and performances. Now in its eight years, 2011 to 2017, “FinTech Future Awards Ceremony” aims to recognize and honor the excellent efforts and accomplishments of organizations and individuals in the industry. Please contact the Organizing Committee for more information of the list and registration. CDMC Finance Research Institute (CFRI) is committed to the sustainable development of China and world’s ﬁnance development through conducting research on 5000+ key ﬁnance companies. With a 7-year proven track record in ﬁnance events, such as payment, online lending, consumer ﬁnance, supply chain ﬁnance, blockchain, AI, Fintech, InsurTech, situational ﬁnance, wealth management, asset management, non-performance asset management, ABS, forex, ﬁnancial derivatives, CFRI has gained deep trust from government, ﬁnancial industry associations, industry experts, and media partners. China Decision Makers Consultancy (CDMC Group), founded in 2004, has become the top brand of Asian international meetings after 14-year-long striving. With a group of more than 100 multinational talents, CDMC has created 7 industry clusters and more than 50 industry conference brands of international inﬂuence, covering energy resources, environmental protection and infrastructure construction, transportation and logistics, ﬁnancial investment, high-end consumption and medicines and food. Every year, CDMC hosts over 30 high-end international conferences, more than 30 industry trainings and nearly 20 domestic and overseas business investigations in China, Japan, India, Singapore, Vietnam and Indonesia.